To get away from the very busy capital, Phnom Penh, I came to Takeo, a rural area, to south of Phnom Penh, where had a few tourists. It took 2 hours by bus. The small town is not a tourist town, so there were no tourists in our bus. The condition of the bus was absolutely terrible with hard seats like stones and no air-con even though it was more than 30 degrees. Once a hatch was opened, much red dust came into. Some local people put on their masks. 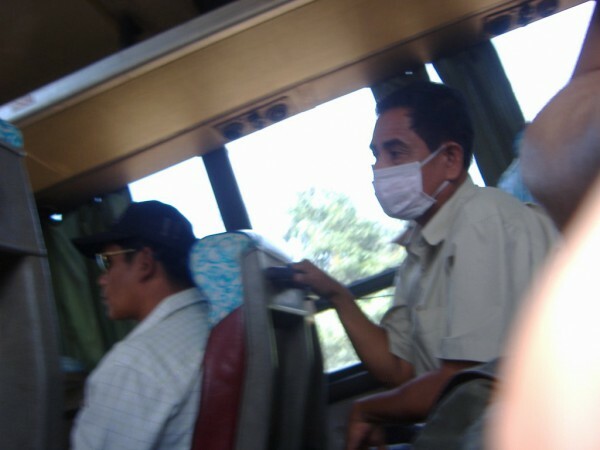 Probably, they always have masks when they take a bus, because this always happens!